Roll out the sleeping bags and fluff the pillows for our free Movie Night Saturday, June 16.The afternoon starts outside at 4 p.m., when we cut the ribbon on our new sandbox cover. You can enjoy a glass of lemonade and join us to thank Karen Spira, who has thwarted the cats that used the sandbox at night for their own purposes. Spira, a member of the site’s Community Recreation Council, found a company that sews specialized sandbox canvas covers, then measured off our box and ordered one. 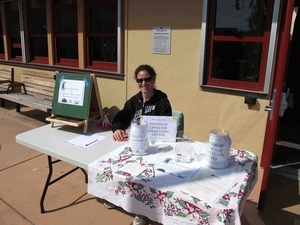 The sandbox cover was paid for by community donations collected by the Friends of Noe Valley Recreation Center. We’ll head inside at 4:30 p.m., grab popcorn and start the cameras rolling on cartoons. 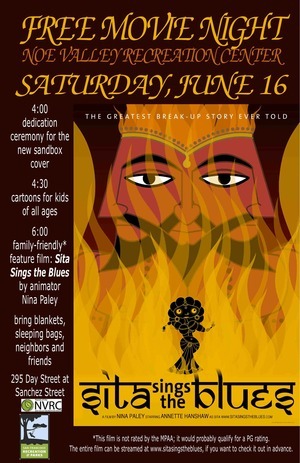 At 5:30 p.m., we will start the evening’s PG-rated feature, Sita Sings the Blues. Filmmaker Nina Paley has cleverly blended cartoon animation, collage and shadow puppets to tell an ancient Indian epic, the Ramayana, alongside a parallel story from her own life. While children will be swept up in the graphics, adults can relate to the movie’s theme: the complications of love. Paley says she focused on the relationship between Sita and Rama, two gods incarnated as human beings who cannot make their marriage work. The film is punctuated by the soulful tunes of jazz-age great Annette Hanshaw. You can preview it online for free at www.sitasingstheblues.com. The event, the popcorn and the clean sandbox are free, courtesy of Friends of Noe Valley Recreation Center. Children are encouraged to bring comfy clothes and padding, and there will be folded chairs as well. Come join us for some summer fun! 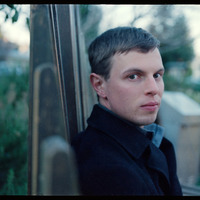 Brian Bergeron brings his mix of folk and rock music to the June 9 afternoon tot concert at Upper Noe Recreation Center. The Massachusetts native played at the Center in December for the Farmer’s Market CD Release Party, and he often appears in shows at colleges, weddings, farmer’s markets and wineries, he said. Recently he has begun collaborating with a band (as yet unnamed) to play at nightclubs. Summer means changed hours for Upper Noe Recreation Center, which will open its doors on Mondays but close the auditorium for tot play during for the week. Like other recreation centers across the city, the Center will be open on Mondays from 9 a.m. to 6 p.m. for the season. The auditorium will be heavily used. On the weekends, our monthly Saturday tot rock concerts have been moved to the afternoon between 2 and 4 p.m. to make way for a Saturday morning Zumba class in the auditorium. The Bernal Heights Recreation Center, 500 Moultrie Street (415-695-5007), has a tot room that is open except during class times on Wednesday and Friday mornings from 10 to 11:30 a.m. The Eureka Valley Recreation Center, 100 Collingwood Street (415-831-6810), has a tot room that will be open from 9 a.m. to 7 p.m. Summer programming was still being settled at this newsletter’s deadline, so call to confirm. There will be programming for tots at Upper Noe. You can see a schedule of classes on our website, or by visiting www.sfreconline.com, or by stopping by the recreation center. All summer programming begins June 4. Want to act? Get in shape? Find your inner balance? Zumba, the dance exercise class set to a Latin beat, on Wednesday and Sunday mornings; yoga followed by indoor boot camp on Tuesday evenings; and Muy Thai kickboxing, a martial art that increases cardio endurance while strengthening core muscle groups, on Wednesday evenings. One of the most fun classes with slots remaining is the adult improv class on Friday afternoons, said Cheryl Woltjen, the site’s facility coordinator. “They do these warm-ups where they scream,” said Woltjen, who says she hears a lot of laughter coming from the stage during class. Participants hone their quick wittedness by ad libbing various scenarios. 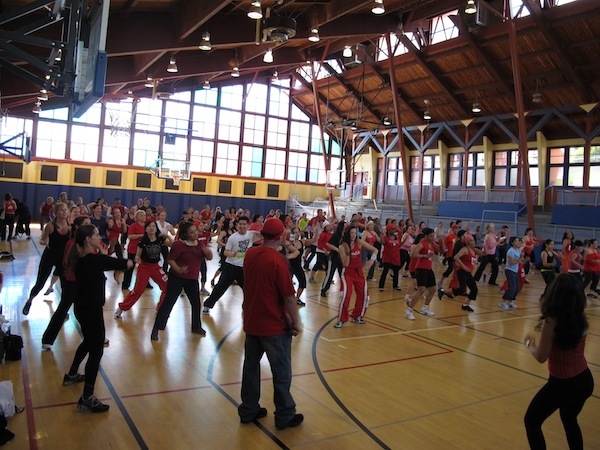 Though it lacks the cardio of kickboxing, the class is active with students moving around quite a bit, Woltjen said. See the summer schedule of classes on our website, or by visiting www.sfreconline.com, or by stopping by the recreation center. All summer programming begins June 4. The Recreation and Parks Department is hosting its own spinoff of American Idol this summer, with competitions for singers, dancers, comedians and band members ages 13 to 24. All who try out will be eligible for coaching workshops that run July 6 to 20. The semifinals will be July 20, and the final competition will happen August 3. Prizes include cash and recording studio time at the Harvey Milk Center. Register from June 1 to 30 and find more audition locations by calling 415-831-6800 or texting 415-205-5971. Click here to link to the registration page. Friends of Noe Valley Recreation Center are applying for a city grant to turn the Sanchez Street side of the building into a more useful space that can accommodate classes and comfortable seating away from the playground. We envision the wheelchair ramp to roll out onto a comfortable and cheerful patio where children can take in the sun while eating lunch or playing away from the playground. The plans call for a level ground, bench seating and added greenery on the patio outside the main Sanchez Street doors. The patio outside the kitchen would expand toward Day Street to the north and Sanchez Street to the west to create an outdoor classroom complete with built-in seating. The adjacent garden sloping down from Sanchez toward the building would be sown with Californa native plants to minimize maintenance. 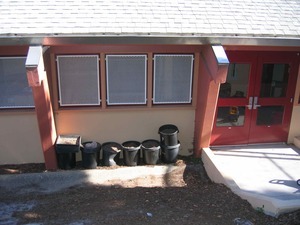 Our hope is to open the door for cooking classes to incorporate urban farming using kitchen gardens and rain barrels. The space could also serve as an outdoor classroom for art, drama and summer camp. We want to hear from you! 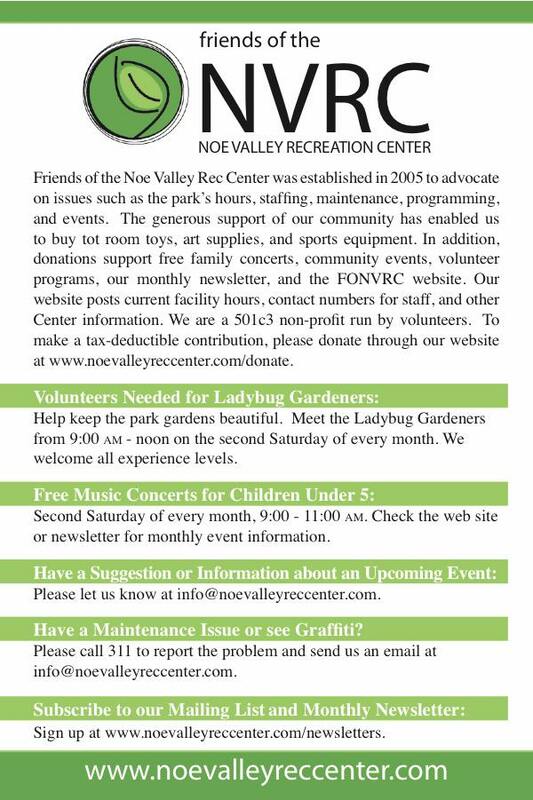 If you have ideas or comments, please email info@noevalleyreccenter.com and let us know. Applications to the Community Opportunity Fund grant are due June 29. The Ladybug Gardeners will be on hiatus until fall. Come September, these volunteers will resume their weeding, planting and beautifying on a weekday rather than on Saturdays. Why? During the week a city gardener is already on-site. By coordinating the volunteer day with the gardener’s schedule, we save the city money; there will be no need to pay a gardener to come for additional hours to supervise the volunteers. • Serve as a greeter for the free concerts. The Friends of Noe Valley Rec Center need a “friend” to help us greet families during our monthly free concert. Let them know about our mailing list and introduce them to our small group. Our greeters hand out flyers and accept donations for the concert series. The next opportunity will be June 9 from 2 to 4 p.m. Even volunteering for one hour would make a big difference! Serve a term on the Upper Noe Recreation Center’s Community Recreation Council and help shape programming at the Center. A teen member is still needed! Please contact Cheryl Woltjen at 970-8061. The form is available on our website and at the center. Please either drop it off or mail it to: Cheryl Woltjen, UNRC, 295 Day Street, SF, 94131. • Distribute our new Friends of NVRC postcard. This newsletter is distributed to nearly 1,000 friends. Make sure interested neighbors know about our group by helping distribute our informational postcard around the neighborhood. Please email molly@noevalleyreccenter.com if you know of a good shop or cafe to distribute the postcards. Or you could help put them somewhere frequented by park users. Are you interested in organizing a new event at the Center? Maybe a game night or movie night? Please let us know. Captain Daniel Mahoney of Ingleside Precinct will talk about the rash of burglaries in our neighborhood. Recently, these incidents have escalated from bicycle theft in garages to hot prowls and even arson attempts, with thieves gaining access through the back of houses. Mahoney will describe the trends and tell us what we can expect for the summer. SFSAFE’s Rob MacKenzie will discuss home security and best practices for keeping neighborhoods safe. 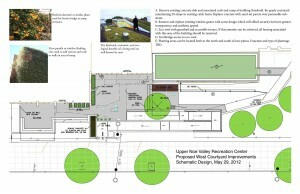 Help shape programming and Upper Noe Recreation Center. Fun for the kids along 24th Street, including a petting zoo.